The Massachusetts Department of Fire Services held its 19th Fire & Life Safety Education Conference earlier this fall, on September 25 and 26. 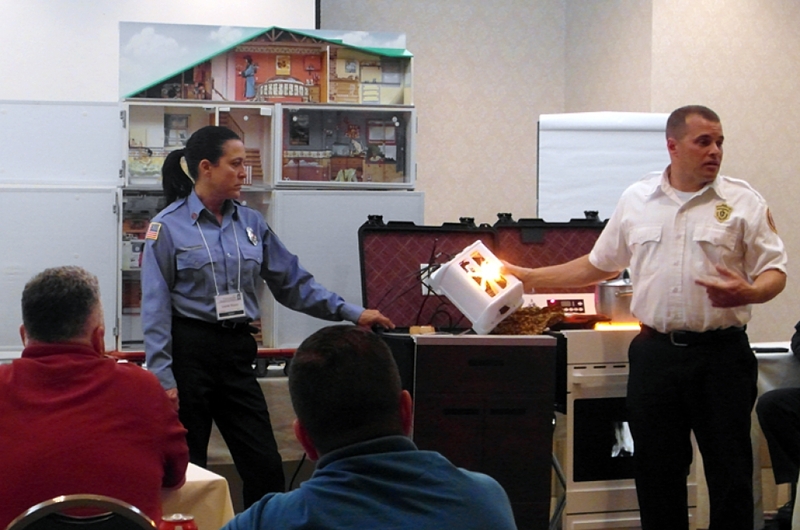 Among the numerous workshops and seminars, a presentation called Playing the Instruments – featuring Modeltech’s very own Hazard House and Hazard Kitchen simulators – showed how the use of props can help support public education. « Educators can be intimidated at first, but you have to see it as just another tool in the toolbox », says Timothy Howe, Assistant S.A.F.E. coordinator and presenter. With the help of fellow educator Laurie Rocco of the Palmer Fire Department, Timothy showed how to set up the simulator from its carrying case, and how the props can be used to cover different topics, through different paths. Props can be a powerful visual aid to reinforce the spoken message. « People remember what they practice », says Jennifer Mieth, Public Information Officer for the Department of Fire Services. « By practicing the correct way to react in a non-threatening environment, we help people overcome their initial instinct and take proper action should the actual situation arise ». The Massachusetts Department of Fire Services owns 2 Hazard Kitchen and 4 Hazard House simulators, which are made available to local fire departments, and also provides training on their use. For the past 18 years, the organization has been sponsoring the state-wide S.A.F.E. Grant for Student Awareness of Fire Education, helping local fire departments offer school presentations. This year, the Department is also introducing the Senior S.A.F.E. Grant, to promote fire safety to the elder population.